I just going to share some pictures of my flowers on this post. 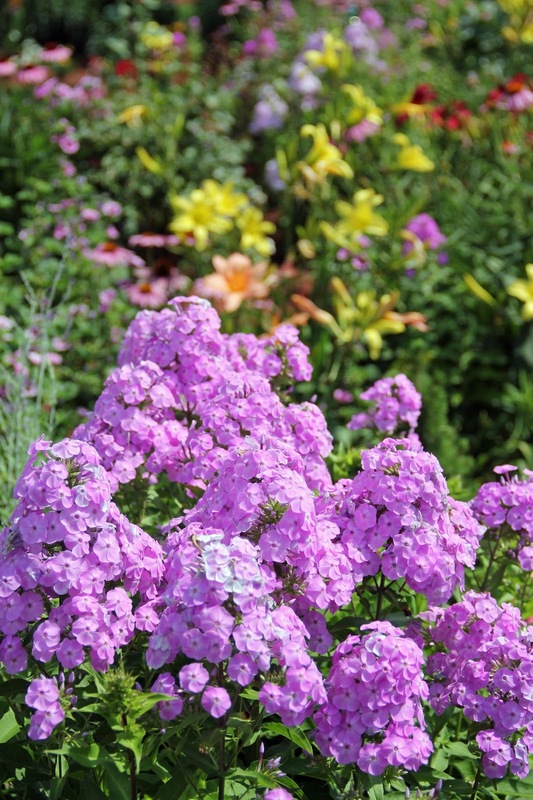 The rain has been plentiful and the flowers are bigger and blooming earlier than normal. I hope some of these blooms stay around for the August 1st wedding and the green grass, too! Hope you don't mind me sharing these images, I just love the flowers. Thanks, Marianne, you are right never a dull moment. 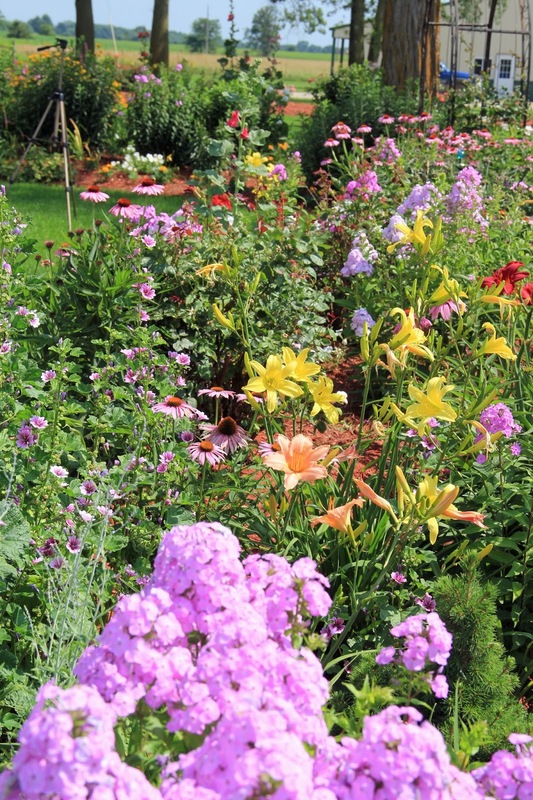 Your gardens are beautiful Lori. Thanks you for sharing! We have had lots of rain too, makes the flowers so happy. Thank you, Lisa, the farmers here have had too much, can't get beans planted, hay cut or wheat harvested but my flowers sure do like the rain. Your garden is beautiful. I wish I enjoyed gardening. My neighbors probably hate my yard. Thank you and the part about the neighbors made me smile. Gorgeous garden! Our grass is already brown. Usually,in the PNW, it stays green until well into summer, but it has been dry and hot! Don't worry...it will be beautiful August too! Thanks, Sue. That is a different summer for you. We just had 3 inches of rain, so I think in 21 days, the garden will be great still. Just gorgeous! 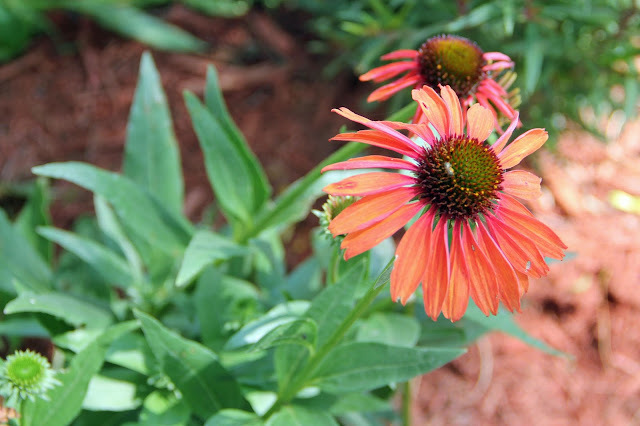 I especially love the coral coneflower - I've not seen them that color before! Thank you, Gail I bought it last year, a new hybrid color. Thanks for sharing your garden. It is just beautiful! I love this time of year. I love your garden! and always enjoy seeing it in your photos. Beautiful. 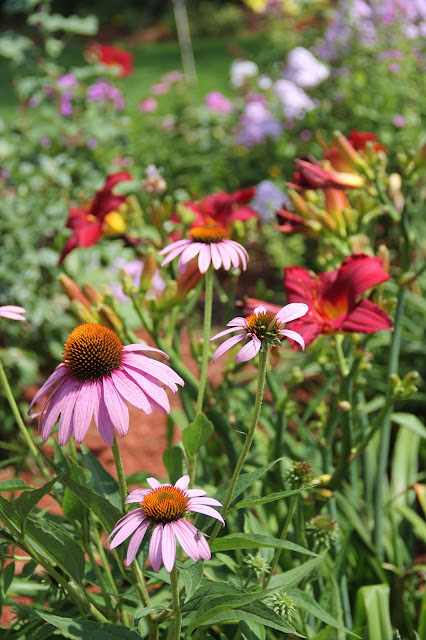 These are outstanding photos of your beautiful flower gardens. I love flowers almost as much as sewing. Thanks for sharing. Hope that they hang out or bloom again for the wedding. Thanks, Rose, I agree sewing and flowers are my hobbies. 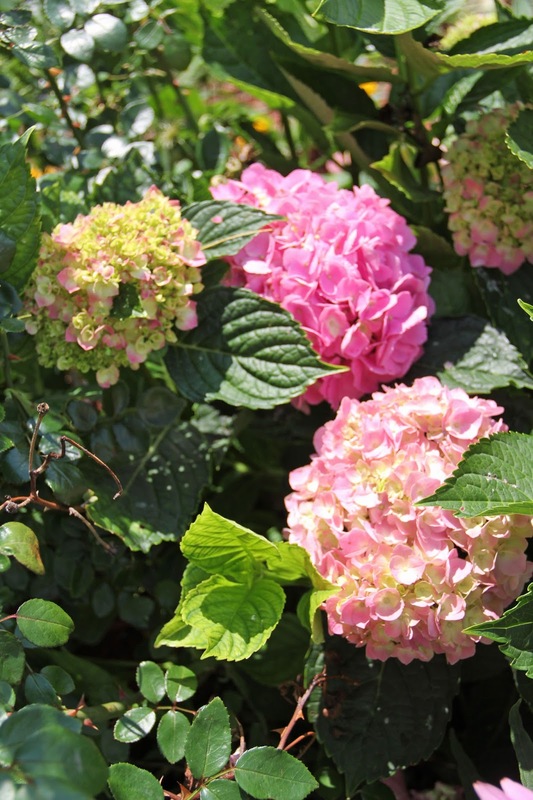 I have so enjoyed spending time in the garden this year. You can probably tell, not at many garments in May, June and July. Beautiful garden and loving the burst of colors. Your garden is gorgeous! Enjoy it! Beautiful! the rain certainly does make a difference in a garden as oppose to daily hose watering. Your garden is lovely! Rain is so much better for the flowers plus easier! Thanks so much. 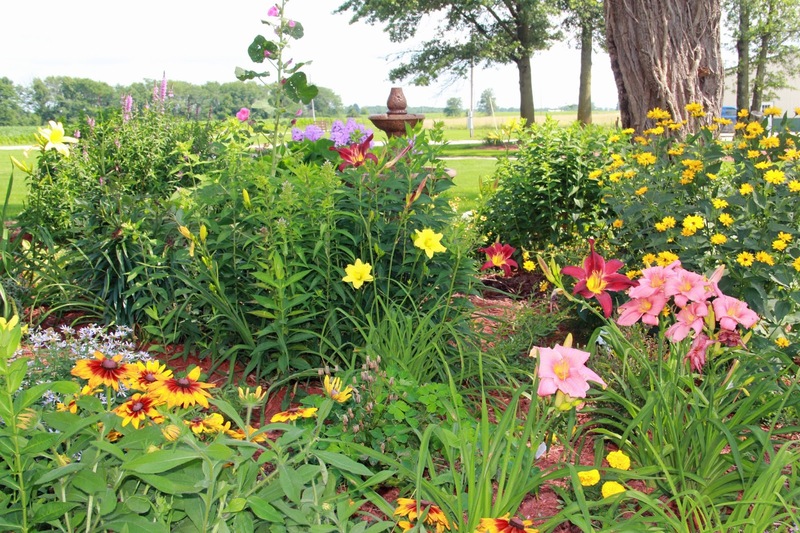 Lori, your gardens are beautiful! thanks for showing your garden, I love seeing it. fantastic. 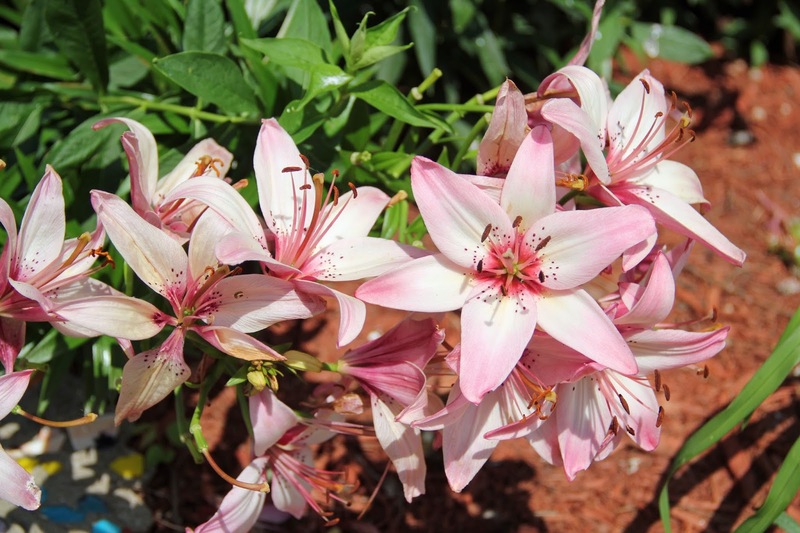 thanks, Beth, I sure do enjoy seeing the flowers on your blog. Glorious flowers, Lori. Thanks for sharing!